I love basil, it hits all the notes for me. Much like cilantro, which is my second fave I’d suppose, it is also a strong and pungent herb that really takes over your senses in a herbaciously delightful manner. Native to India, basil was held in great reverence and was used by Indians to swear their oaths in court. In Italy Basil symbolizes love. Italian suitors signaled their love by courting with a sprig of basil in their hair. Probably the reason I cannot get enough of it 😉 In Mexico it is carried around in the hope of returning a lover’s roving eye. Basil was found growing around Christ’s tomb after the resurrection, and it has been used in the preparation of holy water in the Greek Orthodox church. Pots of basil are kept around the church alters. In some cultures it was feared that scorpions would grow under pots of basil and that smelling the aroma would cause scorpions to grow in the brain! WOW!! These are creative folklore but the truth is basil is incredibly beneficial and is a stunning plant in the landscape. An array of flavonoids exist in basil, which help to protect cells and chromosomes from damage. Studies have shown that two of these flavonoids in particular, orientin and vicenin, are useful in protecting cell structures and chromosomes from damage by radiation and oxygen. Essential oil made of basil has been shown to inhibit the growth of several types of bacteria, many of which have become resistant to antibiotics. This essential oil has been found to inhibit growth of the widespread staphylococcus, enterococcus, pseudomonas, and e. coli bacteria, among others. Adding basil to your vinaigrette will both enhance the flavor, and ensure that the fresh salad greens are safe to eat. Eugenol, which is also found in the essential oil of basil provides an anti-inflammatory effect by blocking an enzyme called cyclooxygenase. Aspirin and Ibuprofen work by blocking this same enzyme. So, basil can have healing benefits, and provide relief from the symptoms of inflammatory problems, like rheumatoid arthritis and inflammatory bowel conditions. Basil is also a good source of vitamin A, which helps to prevent damage to the cells by free radicals. Vitamin A also prevents free radicals from oxidizing cholesterol in the blood stream, preventing the cholesterol from building up in the blood vessels. Magnesium is also present in basil. This essential mineral helps the heart and blood vessels to relax, improving blood flow. Other nutrients found in basil include iron, calcium, potassium, and vitamin C.
The fresh, spicy flavor and scent of basil will wake up any boring salad or soup. Use fresh basil whole, or shredded to add a burst of flavor to your dinner. If you are using fresh basil in a cooked dish, add it towards the end of cooking, so that the volatile oils will not be dissipated by the heat. 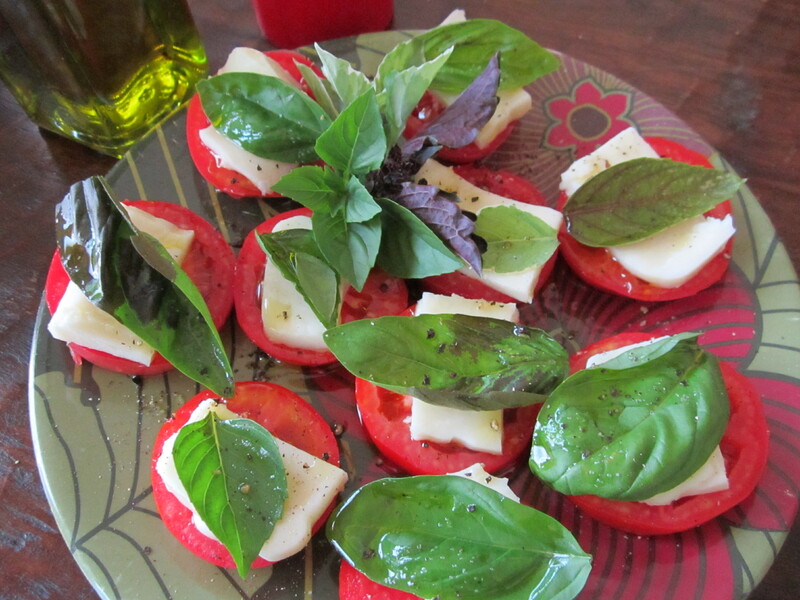 Home grown tomatoes, fresh basil, olive oil and mozzarella cheese, sea alt and cracked black pepper. Insalata Caprice is a simple salad you can enjoy with fresh tomatoes, mozzarella cheese, basil, and olive oil. 1/2 pound, fresh mozzarella, sliced 1/4 inch thick. 2 large tomatoes, sliced 1/4 inch thick. 1 cup fresh basil leaves. another love of mine is basil PESTO! Fresh basil is excellent on pizza and the pesto in place of red sauce is to die for! Home made pizza with garden fresh veggies, olive oil, garlic and garden fresh basil or basil pesto. This is tasty on bread, with pasta, crackers, chicken, fish, or by the spoon full for that matter! This is one of my favorite herbs, for both taste and beauty and I hope I have encouraged you to try it. Now go get your herb garden on! My absolute favorite herb and there are so many healthy reasons to love it!